All photographs in this gallery are © 2004 Charles E. Carroll, and are released under the CC BY 4.0 license (in addition to other licenses which may be mentioned on individual photos). If you use one of these photos, please leave a comment and let me know. All maps belong to planiglobe and are used in accordance with their license. 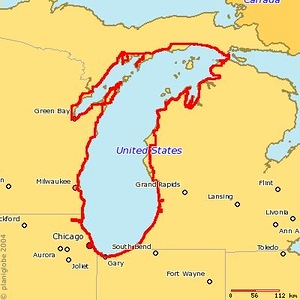 I drove around Lake Michigan from September 2nd through the 8th, 2004. Copyright: All photographs in this gallery are Copyright © 2004 Charles E. Carroll, with all rights reserved unless otherwise indicated on individual photos. All maps (such as this one) belong to planiglobe and are used in accordance with their license.